Plopsaland - Gerstlauer launch coaster 2009 : Theme Park News & Construction! 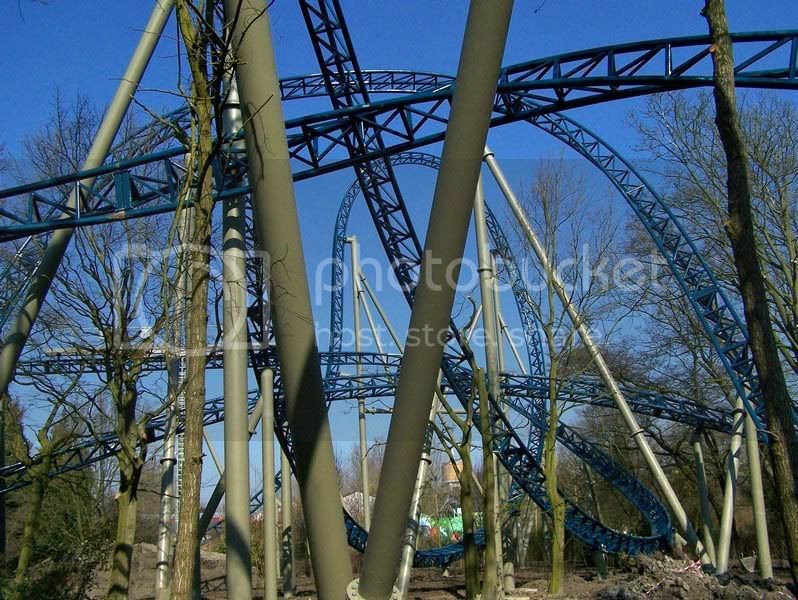 It has been confirmed that Plopsaland will get a launched coaster from Gerstlauer for its 2009 season. It was rumored for some time but finally this design was chosen, a Zierer tower launch coaster like Wicked at Lagoon was also considered as one of the possibilities. 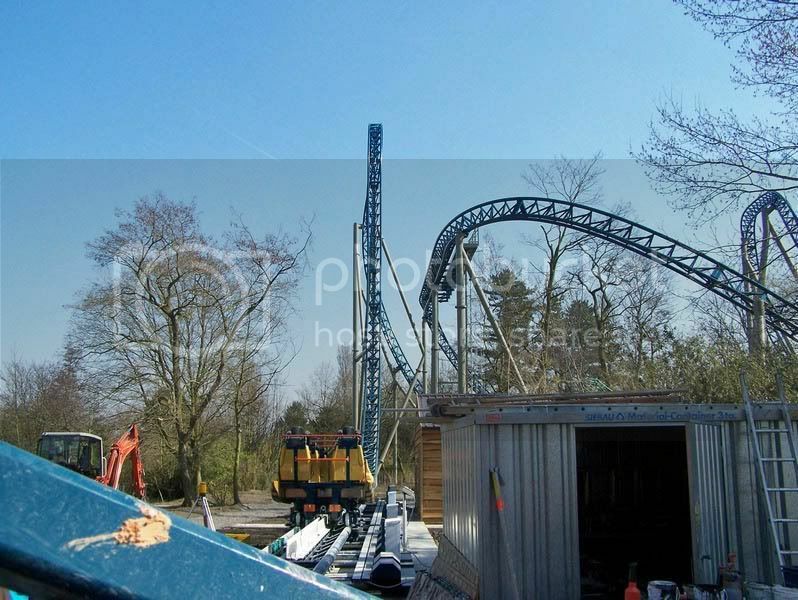 But Gerstlauer was chosen and it'll be building its second launch coaster following Lynet at Farup Sommerland. Trains: 4 cars. Riders are arranged 2 across in 3 rows for a total of 6 riders per car. Last edited by Gav on July 11th, 2008, 9:01 am, edited 1 time in total. Ooo im liking this layout quite alot. The top hat, dive loop, top hat to immelman combo looks really cool. I've never seen anything like it before. It'll be extremely interesting to see how this one turns out. erm... I wouldn't ride this... look at the last picture you posted, in the bottom right corner, I think there is a slight tree collison!!! Yeah thats basically what you would call a fail, lol. I want to get on a gerslauer so bad. I havent gotten on pandamonium at sfne yet. But i definately will. Since i live right near Sfne. Home of the best intamin ever built (and one of the unfortunate chain of the worlds bigest headbangers). I really do like the design! I'm thinking these are some new trains for NL2. Damn sweet. I'm glad Gerstlauer's finally developing their Euros and Launchers to tha max. I have a feeling this and Thorpe's 2009 Gerst are going to be nice milestones in unique thrills. how do you make and/ or get those NL trains? are they gonna be in NL2 or do they have to be custom? If custom, then WTF do you do to make them??? They're company only types. NoLimits Pro. oh. is it released to the public? If not will it ever be??? I don't think so, at least not unless you want to pay thousands of dollars for it. There are also different "Company Only" NL's. One for Vekoma, Gerstlauer, Maurer Sohne, and I think S&S, and each company's version does NOT yield access to the other company's track and trains. I'm sure there are other companies that have it, but I'm not sure of it at the moment. This will surely be an excellent addition for plopsaland, I visited last year and I think a coaster like this would fit in really well there, giving them a something a bit less tame to acompany the star flyer. It's great to see Gerstlauer develop so much so quickly, MOA and Farup's new coasters are great examples of how much they're progressing. I also love seeing a creative layout like this, and an ending with an inversion is always one of my favourite features. Guess this wasn't really followed, but here's some pictures from RCDB. This ride looks enjoyable! Slagharen 2017 - Gold Rush Gerstlauer Launch POV!